Influenza is a viral infection of the lungs characterized by fever, cough, and severe muscle aches. In the elderly and infirm, it is a major cause of disability and death (often as a result of secondary infection of the lungs by bacteria). Even in the young and healthy, influenza produces a prostrating disease of a few days duration and one not soon forgotten. No one at the time even knew what disease agent was causing the pandemic. Not until 1930 (in pigs) and 1933 (in humans) was it established that influenza is caused by a virus. 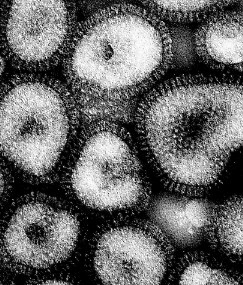 This electron micrograph (courtesy of Dr. K. G. Murti) shows several influenza virus particles (at a magnification of about 265,000x). The surface projections are molecules of hemagglutinin and neuraminidase (see below). Common but seldom causes disease symptoms. Often causes sporadic outbreaks of illness, especially in residential communities like nursing homes. Responsible for regular outbreaks, including the one of 1918. Influenza A viruses also infect domestic animals (pigs, horses, chickens, ducks) and some wild birds. the M2 membrane protein (not shown). The HA gene  encodes the hemagglutinin. 3 distinct hemagglutinins (H1, H2, and H3) are found in human infections; 15 others have been found in animal flu viruses. The NA gene  encodes the neuraminidase. 2 different neuraminidases (N1 and N2) have been found in human viruses; 9 others in other animals. The NP gene  encodes the nucleoprotein. Influenza A, B, and C viruses have different nucleoproteins. The M gene  encodes two proteins (using different reading frames of the RNA): a matrix protein (M1 — shown in blue) and an ion channel (M2) spanning the lipid bilayer (not shown). The NS gene  encodes two different non-structural proteins (also by using different reading frames). These are found in the cytosol of the infected cell, and at least one of them reduces host gene expression. One RNA molecule (PA , PB1 , PB2 ) encoding each of the 3 subunits of the RNA polymerase. Occasional frameshifts during translation of PA produce a protein that reduces host gene expression. The influenza virus invades cells of the respiratory passages. Its hemagglutinin molecules bind to sialic acid residues on the glycoproteins exposed at the surface of the epithelial cells of the host respiratory system. The virus is engulfed by receptor mediated endocytosis. fuse the viral membrane with the vesicle membrane. This exposes the contents of the virus to the cytosol. The RNA enter the nucleus of the cell where fresh copies are made. These return to the cytosol where some serve as messenger RNA (mRNA) molecules to be translated into the proteins of fresh virus particles. spreading the infection to new cells. The result is a viral pneumonia. It usually does not kill the patient (the 1918 pandemic was an exception; some victims died within hours) but does expose the lungs to infection by various bacterial invaders that can be lethal. Before the discovery of the flu virus, the bacterium Hemophilus influenzae was so often associated with the disease that it gave it its name. Three pandemics of influenza have swept the world since the "Spanish" flu of 1918.
the "Swine" flu pandemic that began in April of 2009. The hemagglutinin of the 1918 flu virus was H1, its neuraminidase was N1, so it is designated as an H1N1 "subtype". Here are some others. Until 2009, these data suggest that flu pandemics occur when the virus acquires a new hemagglutinin and/or neuraminidase. For this reason, when an H1N1 virus appeared in a few recruits at Fort Dix in New Jersey in 1976, it triggered a massive immunization program (which turned out not to be needed). However, an H1N1 virus appeared the following year (perhaps escaped from a laboratory) causing the "Russian" flu. We now know that this virus was a direct descendant of the 1918 flu. While accumulating mutations that made it less dangerous, it had been infecting humans until it was replaced by the H2N2 "Asian" flu of 1957. Because most people born before the Asian flu pandemic of 1957 had been exposed to the H1N1 viruses circulating before, the Russian flu primarily affected children and young adults. For the same reason, this pattern was also seen in the 2009-10 pandemic of "swine" flu. Where do the new H or N molecules come from? Birds appear to be the source. Both the H2 that appeared in 1957 and the H3 that appeared in 1968 came from influenza viruses circulating in birds. The encoding of H and N by separate RNA molecules probably facilitates the reassortment of these genes in animals simultaneously infected by two different subtypes. For example, H3N1 virus has been recovered from pigs simultaneously infected with swine flu virus (H1N1) and the Hong King virus (H3N2). Probably reassortment can also occur in humans with dual infections. No antigenic shifts occurred between 1957 ("Asian") and 1968 ("Hong Kong"). So what accounts for the epidemics of 1962 and 1964? Missense mutations in the hemagglutinin (H) gene. change the epitopes on the hemagglutinin molecule (and, to a lesser degree, the neuraminidase) so that they are no longer recognized by the antibodies circulating in the bodies of previous victims. By 1975, the difference had increased to 29 amino acids. The gradual accumulation of new epitopes on the H (and N) molecules of flu viruses is called antigenic drift. Spontaneous mutations in the H (or N) gene give their owners a selective advantage as the host population becomes increasingly immune to the earlier strains. Although a case of the flu elicits a strong immune response against the strain that caused it, the speed with which new strains arise by antigenic drift soon leaves one susceptible to a new infection. Immunization with flu vaccines has proved moderately helpful in reducing the size and severity of new epidemics. Because of antigenic drift, the strains used must be changed periodically as new strains emerge that are no longer controlled by people's residual immunity. simultaneously infected with a stock flu virus that grows very well in eggs. Genetic reassortment produces some viruses with both the new H and N genes along with the 8 other genes from the stock strain. This new virus is then grown in massive amounts and the H and N proteins purified for the new vaccine. The whole process can take up to six months. A promising way to speed things up is described below. Strains used in vaccines for the flu seasons shown. * As the 86–87 season got underway, it was found that A/Chile/83 no longer gave protection so A/Taiwan/86 was offered as a second shot late in that season. Because of antigenic drift, A/Wisconsin/2005 provided only limited protection against the H3N2 virus that circulated in the 07-08 season. The B/Malasia component of the vaccine provided no protection at all. So all three components of the 08–09 vaccine were changed as shown on the next line. the "swine flu" H1N1 – now called A(H1N1)pdm09 – replaced the "seasonal" H1N1 in the 10–11 vaccine. Several vaccines for the 2018-19 season will be quadrivalent; that is, contain a fourth component B/Phuket/2013. FluMist® is a live-virus vaccine that is given as a spray up the nose. It is technically known as LAIV4 "Live Attenuated Influenza Vaccine Quadrivalent". The viruses have been weakened so that they do not cause illness, but are able to replicate in the relatively cool tissues of the nasopharynx where they can induce an immune response. Presumably this is tilted towards IgA production, a better defense against infection by inhaled viruses than blood-borne IgG antibodies. In any case, FluMist® induces a more rapid response than inactivated vaccine and there is some evidence that it provides better protection against antigenic drift as well. Four strains of flu (H1N1, H3N2, and two strains of B) are included. As new strains appear, they can be substituted. On 16 January 2013, the U. S. FDA approved an entirely new type of vaccine. Flublok® is made in cell cultures transformed with recombinant DNA encoding the hemagglutinins of the 3 currently circulating flu strains (H1N1, H3N2, and B). The final concentration of antigens is three times that in the current vaccine. Cultures of insect cells are used so there is no problem with possible egg allergies in those receiving the vaccine. The production process is much faster than with egg-grown vaccines, so a vaccine against a new flu variant can be ready much sooner (weeks instead of months). It takes a while for the flu vaccine to build up a protective level of antibodies. What if you neglected to get your flu shot and now an epidemic has arrived? These drugs inhibit the M2 matrix protein needed to get viral RNA into the cytosol. They work against A strains only, and resistance to the drugs evolves quickly. By the 2009-2010 flu season, virtually all strains of both H3N2 and H1N1 had developed resistance. These drugs block the neuraminidase and thus inhibit the release and spread of fresh virions. Spraying zanamivir into the nose or inhaling it shortens the duration of disease symptoms by one to three days. Unfortunately, by the 2008-2009 flu season, all H1N1 strains circulating in the U.S. had become resistant to Tamiflu. The U.S. FDA approved this new drug on 24 October 2018. It acts by inhibiting the viral RNA polymerase and thus blocks viral replication at an earlier stage than the neuraminidase inhibitors. A single pill given in the first 24 hours after symptoms appear shortens the time to recovery. Antibiotics are of absolutely no value against the flu virus. However, they are often given to patients to combat the secondary bacterial infections that occur and that are usually the main cause of serious illness and death. The mechanisms by which amantadine and zanamivir work provide a clue. There are far fewer anti-viral drugs than antibacterial drugs because so much of the virus life cycle is dependent on the machinery of its host. There are many agents that could kill off the virus, but they would kill off host cell as well. So the goal is to find drugs that target molecular machinery unique to the virus. The more we learn about these molecular details, the better the chance for developing a successful new drug. lung tissue from a flu victim whose body had remained frozen in the permafrost of Alaska since she died in 1918.
a PB1 gene that passed from birds to humans around 1968 and from us to pigs around 1998. Why this remarkable assortment of genes has enabled he virus to jump so successfully from pigs to humans remains to be determined. antibodies from elderly survivors of the 1918 pandemic neutralize the new swine flu virus. Antibodies (raised in mice) to the new swine flu virus neutralize the resurrected 1918 flu virus. The recent pandemic caused serious illness and death mostly in young adults and least in children and the elderly. As for the elderly, this contrast to the usual pattern arose because people over 65, even if not old enough to have been exposed to the 1918 virus, had been exposed to H1 viruses that until 1957 had only drifted from the original 1918 virus, and thus they had developed partial immunity. The antibodies in young adults were specific for seasonal flu strains circulating since 1957. These were unable to protect them against the 2009 virus but may have formed damaging immune complexes with them. Youngsters had no anti-flu antibodies and did not form such immune complexes. Many influenza A viruses are found in birds, both domestic and wild. Most of these cause little or no illness in these hosts. However, some of their genes can enter viruses able to infect domestic animals, as was the case for the PA and PB2 genes of the swine flu of 2009 (above). On several occasions, bird flu viruses have also infected humans, often with alarmingly-high fatality rates. In 2003, human cases of an H7N7 bird flu virus infection occurred in the Netherlands, and in the same year an H5N1 bird virus caused human cases in large areas of Asia. Most of the human cases seemed to have been acquired from contact with infected birds rather than from human-to-human transmission. And now in 2013, a new bird flu virus, H7N9, has appeared in humans in China. By the end of the summer of 2013, it had caused 135 observed cases (no one knows yet whether there may also be infected people who are not sick enough to show up at hospitals). 45 of the observed cases were fatal. The victims appear to have been infected through contact with infected poultry with little or no evidence of human-to-human transmission. As a glance at the tables above will show, humans have had long experience with infections and vaccines by both H1 and H3 flu viruses. But the human population has absolutely no immunity against any H7 viruses. If this virus develops the capability to spread efficiently from human to human, it could lead to another worldwide pandemic. Welcome&Next Search To top of page.